Connection Graphics LLC (Connection Group Inc.) is a certified woman owned business through WBENC Great Lakes Women Business Council. Please download our complete capability statement below. 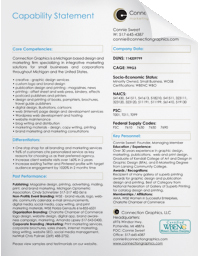 Connection Graphics, LLC is a Michigan based design and marketing firm specializing in integrative marketing solutions for small businesses and corporations throughout Michigan and the United States.